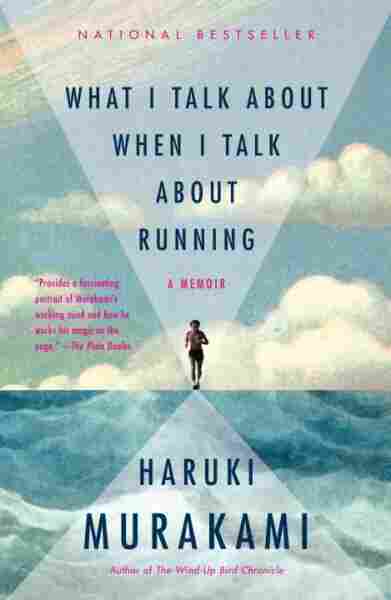 What I Talk About When I Talk About Running NPR coverage of What I Talk About When I Talk About Running: A Memoir by Haruki Murakami. News, author interviews, critics' picks and more. In a best-selling memoir, the award-winning Japanese writer recalls his preparation for the 2005 New York City marathon, interweaving his reflections on the meaning of running in his life, his thoughts on the writing process and career, and his greatest triumphs and disappointments. I'm on Kauai, in Hawaii, today, Friday, August 5, 2005. It's unbelievably clear and sunny, not a cloud in the sky. As if the concept clouds doesn't even exist. I came here at the end of July and, as always, we rented a condo. During the mornings, when it's cool, I sit at my desk, writing all sorts of things. Like now: I'm writing this, a piece on running that I can pretty much compose as I wish. It's summer, so naturally it's hot. Hawaii's been called the island of eternal summer, but since it's in the Northern Hemisphere there are, arguably, four seasons of a sort. Summer is somewhat hotter than winter. I spend a lot of time in Cambridge, Massachusetts, and compared to Cambridge--so muggy and hot with all its bricks and concrete it's like a form of torture--summer in Hawaii is a veritable paradise. No need for an air conditioner here--just leave the window open, and a refreshing breeze blows in. People in Cambridge are always surprised when they hear I'm spending August in Hawaii. "Why would you want to spend summer in a hot place like that?" they invariably ask. But they don't know what it's like. How the constant trade winds from the northeast make summers cool. How happy life is here, where we can enjoy lounging around, reading a book in the shade of trees, or, if the notion strikes us, go down, just as we are, for a dip in the inlet. Since I arrived in Hawaii I've run about an hour every day, six days a week. It's two and a half months now since I resumed my old lifestyle in which, unless it's totally unavoidable, I run every single day. Today I ran for an hour and ten minutes, listening on my Walkman to two albums by the Lovin' Spoonful--Daydream and Hums of the Lovin' Spoonful--which I'd recorded on an MD disc. Right now I'm aiming at increasing the distance I run, so speed is less of an issue. As long as I can run a certain distance, that's all I care about. Sometimes I run fast when I feel like it, but if I increase the pace I shorten the amount of time I run, the point being to let the exhilaration I feel at the end of each run carry over to the next day. This is the same sort of tack I find necessary when writing a novel. I stop every day right at the point where I feel I can write more. Do that, and the next day's work goes surprisingly smoothly. I think Ernest Hemingway did something like that. To keep on going, you have to keep up the rhythm. This is the important thing for long-term projects. Once you set the pace, the rest will follow. The problem is getting the flywheel to spin at a set speed--and to get to that point takes as much concentration and effort as you can manage. It rained for a short time while I was running, but it was a cooling rain that felt good. A thick cloud blew in from the ocean right over me, and a gentle rain fell for a while, but then, as if it had remembered, "Oh, I've got to do some errands!," it whisked itself away without so much as a glance back. And then the merciless sun was back, scorching the ground. It's a very easy-to-understand weather pattern. Nothing abstruse or ambivalent about it, not a speck of the metaphor or the symbolic. On the way I passed a few other joggers, about an equal number of men and women. The energetic ones were zipping down the road, slicing through the air like they had robbers at their heels. Others, overweight, huffed and puffed, their eyes half closed, their shoulders slumped like this was the last thing in the world they wanted to be doing. They looked like maybe a week ago their doctors had told them they have diabetes and warned them they had to start exercising. I'm somewhere in the middle. I love listening to the Lovin' Spoonful. Their music is sort of laid-back and never pretentious. Listening to this soothing music brings back a lot of memories of the 1960s. Nothing really special, though. If they were to make a movie about my life (just the thought of which scares me), these would be the scenes they'd leave on the cutting-room floor. "We can leave this episode out," the editor would explain. "It's not bad, but it's sort of ordinary and doesn't amount to much." Those kinds of memories--unpretentious, commonplace. But for me, they're all meaningful and valuable. As each of these memories flits across my mind, I'm sure I unconsciously smile, or give a slight frown. Commonplace they might be, but the accumulation of these memories has led to one result: me. Me here and now, on the north shore of Kauai. Sometimes when I think of life, I feel like a piece of driftwood washed up on shore. I began living in Cambridge, Massachusetts, at the end of May of this year, and running has once again been the mainstay of my daily routine ever since. I'm seriously running now. By seriously I mean thirty-six miles a week. In other words, six miles a day, six days a week. It would be better if I ran seven days, but I have to factor in rainy days, and days when work keeps me too busy. There are some days, too, when frankly I just feel too tired to run. Taking all this into account, I leave one day a week as a day off. So, at thirty-six miles per week, I cover 156 miles every month, which for me is my standard for serious running. In June I followed this plan exactly, running 156 miles on the nose. In July I increased the distance and covered 186 miles. I averaged six miles every day, without taking a single day off. I don't mean I covered precisely six miles every day. If I ran nine miles one day, the next day I'd do only three. (At a jogging pace I generally can cover six miles in an hour.) For me this is most definitely running at a serious level. And since I came to Hawaii I've kept up this pace. It had been far too long since I'd been able to run these distances and keep up this kind of fixed schedule. There are several reasons why, at a certain point in my life, I stopped running seriously. First of all, my life has been getting busier, and free time is increasingly at a premium. When I was younger it wasn't as if I had as much free time as I wanted, but at least I didn't have as many miscellaneous chores as I do now. I don't know why, but the older you get, the busier you become. Another reason is that I've gotten more interested in triathlons, rather than marathons. Triathlons, of course, involve swimming and cycling in addition to running. The running part isn't a problem for me, but in order to master the other two legs of the event I had to devote a great deal of time to training in swimming and biking. I had to start over from scratch with swimming, relearning the correct form, learning the right biking techniques, and training the necessary muscles. All of this took time and effort, and as a result I had less time to devote to running. Probably the main reason, though, was that at a certain point I'd simply grown tired of it. I started running in the fall of 1982 and have been running since then for nearly twenty-three years. Over this period I've jogged almost every day, run in at least one marathon every year--twenty-three up till now--and participated in more long-distance races all around the world than I care to count. Long-distance running suits my personality, though, and of all the habits I've acquired over my lifetime I'd have to say this one has been the most helpful, the most meaningful. Running without a break for more than two decades has also made me stronger, both physically and emotionally. The thing is, I'm not much for team sports. That's just the way I am. Whenever I play soccer or baseball--actually, since becoming an adult this is almost never--I never feel comfortable. Maybe it's because I don't have any brothers, but I could never get into the kind of games you play with others. I'm also not very good at-one-on-one sports like tennis. I enjoy squash, but generally when it comes to a game against someone, the competitive aspect makes me uncomfortable. And when it comes to martial arts, too, you can count me out. Don't misunderstand me--I'm not totally uncompetitive. It's just that for some reason I never cared all that much whether I beat others or lost to them. This sentiment remained pretty much unchanged after I grew up. It doesn't matter what field you're talking about--beating somebody else just doesn't do it for me. I'm much more interested in whether I reach the goals that I set for myself, so in this sense long-distance running is the perfect fit for a mindset like mine. Marathon runners will understand what I mean. We don't really care whether we beat any other particular runner. World-class runners, of course, want to outdo their closest rivals, but for your average, everyday runner, individual rivalry isn't a major issue. I'm sure there are garden-variety runners whose desire to beat a particular rival spurs them on to train harder. But what happens if their rival, for whatever reason, drops out of the competition? Their motivation for running would disappear or at least diminish, and it'd be hard for them to remain runners for long. Most ordinary runners are motivated by an individual goal, more than anything: namely, a time they want to beat. As long as he can beat that time, a runner will feel he's accomplished what he set out to do, and if he can't, then he'll feel he hasn't. Even if he doesn't break the time he'd hoped for, as long as he has the sense of satisfaction at having done his very best--and, possibly, having made some significant discovery about himself in the process--then that in itself is an accomplishment, a positive feeling he can carry over to the next race. The same can be said about my profession. In the novelist's profession, as far as I'm concerned, there's no such thing as winning or losing. Maybe numbers of copies sold, awards won, and critics' praise serve as outward standards for accomplishment in literature, but none of them really matter. What's crucial is whether your writing attains the standards you've set for yourself. Failure to reach that bar is not something you can easily explain away. When it comes to other people, you can always come up with a reasonable explanation, but you can't fool yourself. In this sense, writing novels and running full marathons are very much alike. Basically a writer has a quiet, inner motivation, and doesn't seek validation in the outwardly visible. For me, running is both exercise and a metaphor. Running day after day, piling up the races, bit by bit I raise the bar, and by clearing each level I elevate myself. At least that's why I've put in the effort day after day: to raise my own level. I'm no great runner, by any means. I'm at an ordinary--or perhaps more like mediocre--level. But that's not the point. The point is whether or not I improved over yesterday. In long-distance running the only opponent you have to beat is yourself, the way you used to be. My peak as a runner came in my late forties. Before then I'd aimed at running a full marathon in three and a half hours, a pace of exactly one kilometer in five minutes, or one mile in eight. Sometimes I broke three and a half hours, sometimes not (more often not). Either way, I was able to steadily run a marathon in more or less that amount of time. Even when I thought I'd totally blown it, I'd still be in under three hours and forty minutes. Even if I hadn't trained so much or wasn't in the best of shape, exceeding four hours was inconceivable. Things continued at that stable plateau for a while, but before long they started to change. I'd train as much as before but found it increasingly hard to break three hours and forty minutes. It was taking me five and a half minutes to run one kilometer, and I was inching closer to the four-hour mark to finish a marathon. Frankly, this was a bit of a shock. What was going on here? I didn't think it was because I was aging. In everyday life I never felt like I was getting physically weaker. But no matter how much I might deny it or try to ignore it, the numbers were retreating, step by step. Besides, as I said earlier, I'd become more interested in other sports such as triathlons and squash. Just running all the time couldn't be good for me, I'd figured, deciding it would be better to add variety to my routine and develop a more all-around physical regimen. I hired a private swimming coach who started me off with the basics, and I learned how to swim faster and more smoothly than before. My muscles reacted to the new environment, and my physique began noticeably changing. Meanwhile, like the tide going out, my marathon times slowly but surely continued to slow. And I found I didn't enjoy running as much as I used to. A steady fatigue opened up between me and the very notion of running.